Most of our players were in the same situation you might be in -- you have no experience with the sport and aren't 100% sure the sport is for you. While lacrosse is the fastest growing sport in America, it is relatively new to Des Moines area and the state of Iowa. WDM LAX can help you try the sport with no cost or obligation. 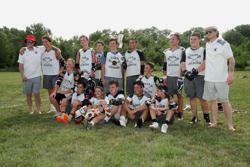 Simply let us know of your interest and we'll invite you to a couple of practices to try lacrosse. You can borrow equipment from the coaches. They'll be happy to work with you and answer your questions. If you like the experience and want to become part of the club, we'll ask that you register with US Lacrosse and our program. We accept all boys and girls (grades 4-12), and many with no prior experience. We find new players pick up the sport quickly and love the game! Send us an email and we'll get you involved. Players are responsible for providing their own equipment*! Uniforms and practice jerseys are provided by the club. Colored mouth guard - White and clear are not allowed under league rules! Cleats - Do not have to be lacrosse-specific; soccer & football cleats work just fine. Black, white, or orange cleats are preferred. The following must be Lacrosse-specific gear; hockey equipment is not allowed!!!! Helmet: All varsity players must have a black lacrosse helmet. Non-varsity players may use another color if they already have a helmet. New helmets should be solid black with a black chinstrap, and a chrome mask. The brand and model do not matter, but the top recommendation is the Cascade CPX-R. Goalies also need a throat protector. Shoulder Pads. Goalies use a position specific chest protector instead of shoulder pads. Elbow Pads - please purchase black or white pads. Goalies are not required to wear elbow pads. Goalies may opt to wear soccer shin guards during games. Cleats - Do not have to be lacrosse-specific; soccer cleats work just fine. Black, white, or orange cleats are preferred. * The club does have equipment that you can borrow. Please contact us if you would like to borrow equipment for the season. Lacrosse equipment is available from Slapshot Hockey and Lacrosse Shop - see link on home page.